Ben Falk is the owner of Whole Systems Design, LLC, and author of the book The Resilient Farm and Homestead. He works as a designer, builder, and ecologist, and has more than 200 site development consultations across New England. Moreover, he has facilitated dozens of courses on permaculture design, property selection, microclimate design, and design for climate change. His WSD studio site in Vermont’s Mad River Valley functions as a proving ground for the regenerative land developments featured in the projects of Whole Systems Design. Today, his site is 10 acres of wet field and forest that is transitioning into an edible landscape of ponds, fruit and nut trees, forest and pasture, stone and timber structures and outdoor living spaces. The farm is located on a slope, with a series of terraced ponds that trickle nutrients down to a series of natural detention basins growing rice, as well as building rich soil in the process. In the beginning, the land was overgrazed, clearcut and abandoned, planted with white pine forest. 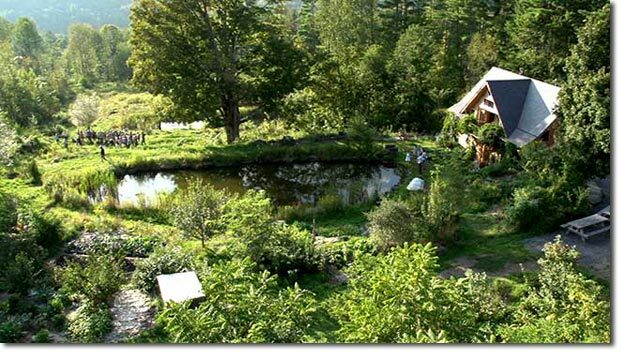 However, in the last ten years Ben has managed to transform it into a showpiece for what is possible when you use the principles of permaculture. Ben has invested himself into developing the site, eventually setting it as a portfolio one. His expenses are low because he lives in a well-designed and energy-efficient studio. 80% of his calories come from the homestead, and he can also gather fuel, building materials and other resources from the site. This said, his income comes from designer work, consulting, teaching PDC and speaking. His main source of income is from landscape architecture professional practice – from property selection to site development, master planning and site design, and construction and project management. He consults, as well as performing full implementation services, during all phases of this process. On top of this, he has a nursery business and is well known for his work on Seaberry popularization. • Establishing a keynote portfolio site is very important in demonstrating to people what works – it also helps with gaining employment as a consultant and in encouraging people come to workshops, PDC-s and tours on the site.